In application, the new Bonding Adhesive BA-2012 is more fluid and with a higher solid content, resulting in improved coverage rates. In addition, the BA-2012 can be applied using a roller, SuperSpreader or sprayer. The latter methods result in even higher coverage rates. Now available in three different sizes: 2.5, 5 and 10 L pails, with excellent coverage of: 2.5L - 7.5m2 5L - 15m2 and 10L - 30m2. Additional information about Bonding Adhesive BA-2012 can be found in the Technical Information Sheet and Safety Data Sheet. Product code: fsba2012. For further product information please do not hesitate to contact us. 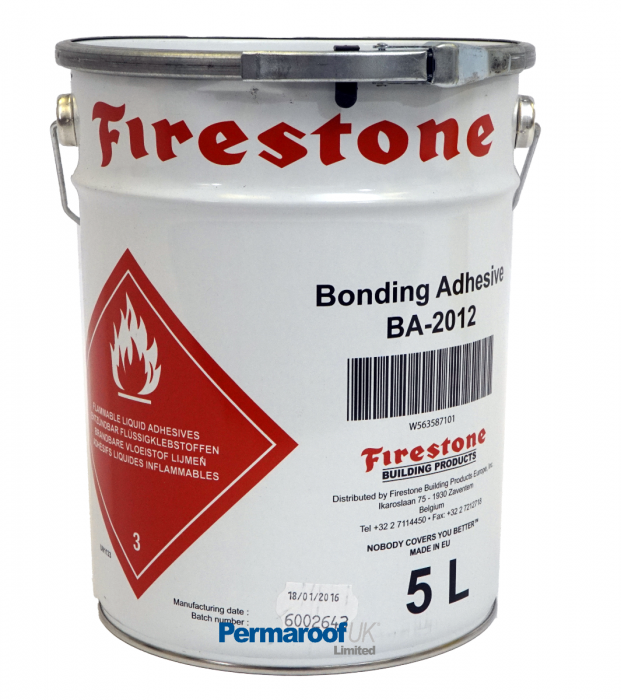 For more information you can find the Firestone Bonding Adhesive BA-2012 here.